born an orphan, Adamun was adopted into the home of Lhor Xenon, a specialist in alchemy and science. Adamun was trained under Lhor Xenon and eventually became Steward of his House when Xenon fell during the Lemithian Civil War and Xenon's only daughter, Krysa, went into self-imposed exile. In Kalon, Adamun lives in wealth and prosperity as Kalon's chief source of arms manufacturing. Adamun divides his time between running the weapons manufacturing operations, research and development, and strategy with the Pakhawaj Clan as a consultant. He eventually allies himself fully with the clan when they break off of Kalon for a chance at researching his own ideas, instead of adapting Xenon's prior work. He seeks out Krysa to give her her title back and to make a name for himself as a master weaponist. Before leaving, Adamun was researching in transmuting parts of the body into other properties, like metal or fire. He developed a chemical formula, yet needed a means to sustain its changed state for longer periods in order to be effective in battle. 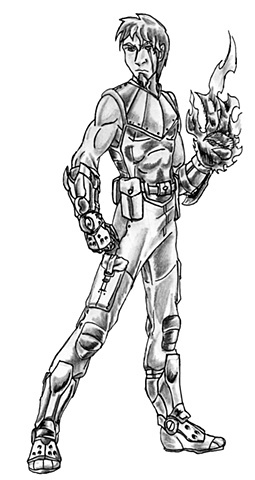 This eventually led to developing his gauntlets and shinguards as the deployment device for this chemical compound. Adamun went through the least redesign as I made this look prior to the initial reboot and kept it as I liked the style of it, the only thing I changed up was the design of his gauntlets and boots, as the I made them more detailed. It may be a bit biased, but when I see a design that feels solid, I stick with it.